Handheld tools were essentially humankind’s first technology, and many – consider the hammer – have remained largely unchanged in the eons since. The development of power tools meant that the operator no longer required physical strength to complete a task, but many such tools still necessitated a certain degree of skill and training to avoid serious injury. Now researchers are working to develop autonomous robot tools that will greatly decrease the risk associated with these devices. Robotic tools: handheld autonomous and semi-autonomous robots will soon make a variety of tasks safer and easer. Image from the University of Bristol. The team at the University of Bristol will be reporting their findings this week at the IEEE International Conference on Robotics and Animation. The instruments are designed with two major differences from traditional power tools. The first is that they have a greater range of motion, giving them more freedom to perform tasks independent of the user’s input. Second, they are equipped with basic intelligence allowing the robotic tool itself to be aware of the steps underway. The authors state that these two features allow a “new level of co-operation between user and tool”. Typically, robotics have taken one of two forms; either a fully autonomous system which can operate remotely using human input, things like bomb defusing robots or the Mars rover, or a wearable device which relies on constant cues from the user, like an exoskeleton or motorized wheelchair. The newly-reported robotic tools are set to bridge the gap between these two alternatives. The theory being that a best-of-both-worlds situation will arise when the intuitiveness of handheld tools can be coupled with the cognitive and actuation abilities of a complex machine. Despite the obvious advantages of such a strategy, it has not been widely exploited so far and most examples are in the field of medicine. These include surgical robotic scalpels which allow more accurate bone shaping or special stabilized spoons for patients with tremors. 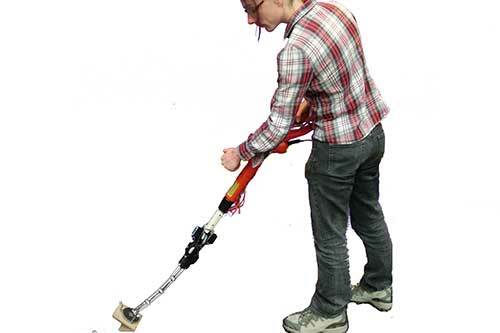 The prototype the team developed was based around a commercially available weed whacker which was selected for its low cost, the ease with which users can adapt to it, and the flexibility of tasks it can perform. A carbon fiber robot arm was attached to the end of the shaft and a software control mechanism developed. The robot arm was then evaluated based on its performance at two common tasks – simulated painting, which entails three-dimensional positioning in space, and picking and placing of objects. Interestingly, the authors decided to analyze the capabilities of the tool as a function of its autonomy. That is, how much better would it perform when the degree of human input was steadily decreased? Perhaps unsurprisingly, “increasing the level of autonomy reduces the completion time and perceived task load”. The use of handheld robots has been largely unexplored until now, particularly outside the medical arena, but this early demonstration shows the many potential benefits of such devices. Much like self-driving cars, after the initial learning curve, the adoption of these tools will make the tasks in which they are involved safer, more efficient and more accurately accomplished by removing human error from the equation. Admirably, the team has made all their designs open source so anyone out there with an interest can contribute to this ongoing design project. Via Science Daily, the University of Bristol, and IEEE. Should Google Fight For Internet Freedom Or Privacy Of The Individual?